Unbelief is a robber of grace. It diminishes our ability to hope and destroys our creativity to dream. It is the opposite of the affirming promises found in God’s Word. We can see the enmity that it places on the promises His Word affirms clearly, like a weapon of the enemy to steal, kill and destroy what Christ came to give. I have come that you may have and enjoy life, and have it in abundance, till it overflows. Unbelief is a deterrent of purpose. It distracts us from the path we were meant to walk on. It steals and destroys and weakens faith till it is inactive. And not only faith is diminished by the arrows of doubt, but dreams wither and die in the adversity it seems to shadow over our lives. If we have faith, if we believe God, He will show up…He will reward our diligence. Hebrews 11 talks about faithful dreamers who were prompted and urged and provoked to big faith. A Hall of Fame recounting those who chose brave faith in spite of what they did not see…dreamers who dared to dream dreams. Right in the middle of this narration is a conjunction of sorts, a phrase that joins the beginning to the end, the origin to the goal, the idea to the dream. It’s a reminder to each of us, who choose to dream with God on this journey, that belief is rewarded not so much with our hope but with God instead. Sometimes it’s the ordinary dreams that take the greatest amount of faith. There is a dreamer who wasn’t mentioned by name in this chapter, but her story rivals those summarized there. A recounting of those who did something extraordinary things out of ordinary faith all because they made the choice to seek first the One Who is the original mover of every dream. Hannah is one of my heroes in the book of women who believed God for something bigger than herself. She had a simple dream that took mountain-moving faith to see fulfilled. Her narrative tells us who she was identified as, Elkanah’s wife; what was lacking in her life, children; and what she did, she prayed. What strikes me about this first chapter of Samuel is not that Hannah felt unloved but rather unpurposed. She knew she was loved and favored by her husband, but it wasn’t enough. In her distressed and bitter state, she prayed to the Lord to fulfill a dream…to fill her soul with the resurrection of a broken and unmet goal. She went to the altar of grace and poured her dreams out of her soul into His hands in an action of surrender and trust. What Hannah didn’t know, which is similar to each of us now, is that the fullness of the unrealized dream could never come to fruition until the timing of His fullness was met within her. With a prayer of desperation and vow of faith, Hannah sought the only One Who could meet her need. She begged for a remembering, a resurrecting and redeeming of the hope that had been deferred by time and lack and loss. In one act of faith, a surrendering of herself back to the Lord Who planted the spark within. As Hannah went to the temple to pray, she knelt low to surrender her dreams, she asked to be remembered, she poured out her soul in faith. She went for a miracle and she left with God. Hannah went seeking provision for her deepest hurt and found the God Who supplies provision for her every need. Surrendering all she held in her heart: dreams, goals, wishes and bitterness, envy, hurt, she let go of the disease of unbelief. In her weariness, she asked for grace and was met by peace. Her countenance was changed in a way that was both felt and seen. It was in that moment, where she decided to surrender it all in search of the ONE Who fills us as nothing on this earth can, that she found the miracle she seeking. Like Hannah, when we surrender all we have and all that we are on the altar of His grace, we will find that the One Who fills us is also preparing us for the dreams He has encrypted into the very fabric of our souls. Right in the middle of every dreamers story is a pause, a waiting space of holy hope which has the power to impregnate a faith seed so powerful that it will change us completely. She came to the throne of grace to receive well-timed help in her time of need. She came believing that He is Who He said He was. Not only did He resurrect her broken faith, rerouting her unbelief and changing the course of her destiny in the narrative of her story, He redeemed every broken dream, fulfilled her surrendered goals, and filled her with a seed of promise that would define her. Praying that you will find your way to the altar of grace today, to surrender all that is in your heart to the One Who is waiting to fill you with all He has prepared for you. 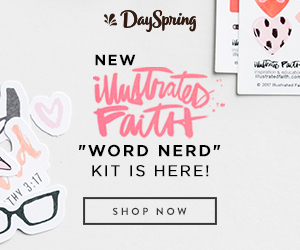 A word-loving, coffee-drinking grace girl, who thinks her favorite title is Mom. However, once in awhile she will write a few things that spill from her heart onto the white space that houses her desire to share her journey with others. Prayer and a deep love for God's Word are her passion, but she has been known to lace up shoes and count steps for fun or lose herself in the kitchen with her kids. She loves to sit across the table from friends lost in deep conversation or looking for the hidden beauty all around with her camera lens. 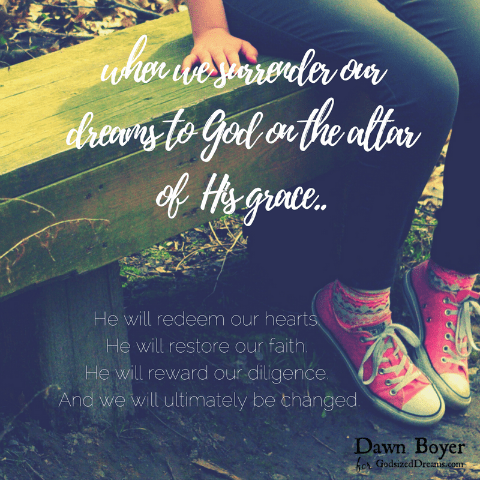 Sometimes she writes about those hard questions that come in life, reasoning and rejoicing in God’s grace and mercy with those who are walking this journey to grace with her and resting in prayer as often as she can on her blog, Journeys In Grace. 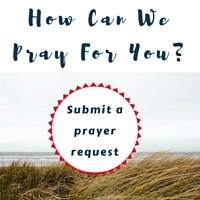 Connect with her on Facebook, Instagram, or Pinterest. I love the reminder to come to God for faith. It’s easy to get mixed up in this world, even in Christian circles, that faith is something we need to achieve on our own or that it is a magic pill. Faith comes from God. Going to Him is the miracle and that is why we are blessed. Every word of this post will breathe encouragement, life, and hope into every dreamer. This > “She went to the altar of grace and poured her dreams out of her soul into His hands in an action of surrender and trust.” So grateful you shared your words with us all! Amen Joanne! I pray that there is a breath of grace encouraging each and every heart that stops to read the words above. Mostly that we would all, like Hannah, find a way to the altar of His love and pour out our weariness and take in His love. Not unloved but “unpurposed.” What a terrific insight, Dawn. And how we need to have the blessing of God’s assurance that He has “purposed” us! Thanks for this new way of looking at Hannah’s story. Hannah’s story is so poignant and full of things to ponder. In her culture a woman who couldn’t have children felt as if she had no purpose, but in Him we are made worthy of the high calling of daughter and beloved and it took surrender for Hannah to see it. So grateful you found a new way to see the lesson of her narrative. Thanks for hosting, Dawn, and for bringing your insight to Hannah’s story … one of my favorites! So grateful you are here, Donna. I love Hanna’s story so much and it is always good to find a friend who appreciates similar things together. I love Hannah’s prayer of praise in 1 Samuel 2:1-10, and then she gives her miracle child back to the Lord. Her prayer is similar to Mary’s in Luke 1:46-55, the Magnificat. They are both so beautiful and strong in praise and proclaiming the power of God. This is a very encouraging post today, thank you Dawn. The resemblance of those prayers is amazing, isn’t it? I love Mary’s prayer in Luke 1, too. They are both a reminder for us to give to God our everything and to take in His. So glad you were here and reminded me of that. Dawn, I have been trying to get to reading this all day long. God put obstacles and in my way all day long and now I know why. I am sitting in the airport heading home and I so needed these words right now in this moment. I needed to be still enough to take them in. Your words have ignited in me a hope and a dream I may have set aside or settled for less. But my GOD IS BIG!!!!! I am praying and dreaming for it all right now. For most it would be an ordinary dream but for me it is an extraordinary dream that only God can do. I have never doubted he could do it but sometimes I get in the way. Your words have encouraged me to be on fire in my prayers and to put my faith and trust in God and back a way a bit. Thank you from the bottom of my heart. Your words here.. they have blessed my heart. I am so grateful you shared this. Thank you. Praying for you, friend, to be full and overflowing with hope and expectation for all He has for you. So encouraging. Thank you so much for this. Thanks Vicki! May you be lifted and filled like Hannah, full of Him and His love and His goodness for you!